Big Buck's is one of 13 runners for the Ladbrokes World Hurdle on March 15 as he aims to create history by becoming the first horse to win the same race at the Cheltenham Festival four years running. This year’s Betfred Cheltenham Gold Cup (3.20pm) is set to be another superb contest with Long Run and Kauto Star featuring among 19 six-day confirmations for chasing’s Blue Riband, highlight of Gold Cup Day on Friday, March 16. It’s almost inconceivable that Big Buck’s will be toppled when he goes to post for the Ladbrokes World Hurdle at the Cheltenham Festival on March 13. Jockey Dominic Elsworth clearly has a very soft spot for Henrietta Knight's talented chaser Somersby, the horse who gave him his first Grade 1 success when bravely landing the Victor Chandler Chase at Ascot. Hurricane Fly, the winner of the Champion Hurdle at Cheltenham in March is set to make his seasonal debut in a few weeks time in the Morgiana Hurdle at Punchestown on 20th November. In the Gold Cup's history only seven horses have won more than once, and the most recent of them is Kauto Star in 2007 and 2009. The others were Best Mate (2002/03/04), L'Escargot (1970/71) Easter Hero (1929/30), Golden Miller (1932/33/34/35/36), Cottage Rake (1948/49/50) and Arkle (1964/65/66). 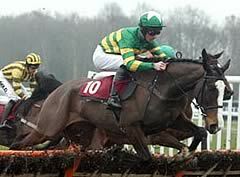 All the successes were in consecutive years except for Kauto Star, the only horse to regain the title. Cheltenham Festival is one of the highlights of the English sporting year. Cheltenham Festival 2012 promises to be no different. Will Kauto Star again be the star of the party? As in previous years, Privilege will be operating a Helicopter Shuttle direct to Cheltenham Racecourse from their Temporary Heliport at the junction of the A.40 and the A.436 at Andoversford, adjacent to The Frogmill Hotel, which has now re-opened after a muti-million pound refurbishment.